The National Education Association just filed its 2016-2017 financial disclosure with the U.S. Department of Labor — and it is clear that the nation’s largest teachers’ union is spending even more to maintain its influence in education policy. Whether or not it benefits the teachers who are often forced to pay into its coffers is a different story. The Big Two union spent $151 million on lobbying and contributions to supposedly likeminded organizations during its last fiscal year. That’s a 9.4 increase over influence-buying levels in 2015-2016. This, by the way, doesn’t include another $43.7 million in spending on so-called representational activities in 2016-2017, which almost always tend to be political in nature; that’s six percent less than in the previous period. As you would expect, NEA put a lot of cash into its Advocacy Fund, the Super-PAC that is part of the union’s effort to back Congressional Democrats. It put $7 million into Advocacy Fund in 2016-2017, a 35.8 percent decrease over the previous year. Given that this an election year, the lower levels of funding isn’t shocking. But you can expect NEA to pour even more money into the Super-PAC next fiscal year — if the U.S. Supreme Court’s ruling in Janus v. AFSCME doesn’t short-circuit those plans first. The union also spent big on last year’s Democratic National Convention, lobbying delegates and others as they formalized Hillary Clinton’s since-unsuccessful campaign for the presidency. It spent $525,004 in 2016-2017. This included handing $50,000 to the Atlantic Monthly (which was criticized by reformers back in September for receiving money from the American Federation of Teachers), as well as spending $46,000 with pollster Anzalone Liszt Grove Research. Meanwhile NEA gave $100,000 to Majority Forward, a 501(c)4 affiliated with the Senate Majority PAC, the Super-PAC controlled by J.B. Poesch, a former head of the Democratic Senatorial Campaign Committee and ally of Minority Leader Charles Schumer. It also dropped$100,000 into the coffers of Patriot Majority, another Super-PAC that backs Democratic candidates for the House and Senate. Both donations were made in September 2016, two months before the general election. Given how poorly Clinton and the Democrats fared last year, the spending didn’t yield any immediate results. But NEA will continue to give. This includes pouring $500,000 into Main Street Advocacy Fund, the affiliate of Republican Main Street Partnership that has been one of its most-important vassals. While NEA failed miserably at the national level, it spent $11.1 million on ballot initiatives with some success. The union gave $4.9 million in 2016-2017 to Save Our Public Schools, the Massachusetts coalition run by its Bay State affiliate and its longtime vassal, Citizens for Public Schools, that defeated Question 2, the ballot measure that would have expanded the number of public charter schools in the state. This came on top of the $500,000 NEA gave the committee in the previous year. As Dropout Nation detailed last year, the defeat of Question 2 was a solid victory for the union and its fellow traditionalists while reformers reeled from the loss. NEA also gave $4.2 million in 2016-2017 to Committee to Keep Georgia Schools Local, a coalition featuring NEA’s Georgia Association of Educators that defeated Gov. Nathan Deal’s plan to allow the Peach State to take over 127 failure mills and put them into a statewide district. That was on top of the $500,000 the union gave in the previous fiscal year. 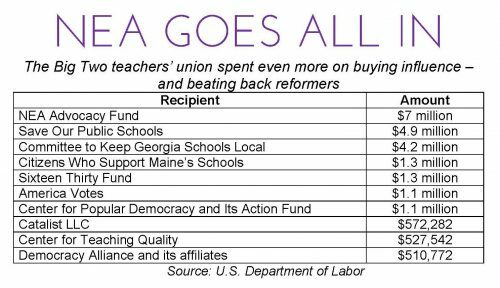 In Maine, NEA gave $1.3 million to Citizens Who Support Maine’s Public Schools, a coalition including the union’s state affiliate; this was on top of the $1 million the union gave to the group in 2015-2016. The group would go on to successfully push for the passage of Question 2, a ballot measure to levy a three percent tax on incomes of greater than $200,000 ostensibly to provide $320 million in new funding to the state’s traditional public schools. But that victory was short lived. Last July, after a three-day shutdown of the state government Gov. Paul LePage convinced legislators to repeal Question 2 and replace it with a plan to provide just $160 million a year in new funding. Meanwhile NEA gave $225,000 to Educators for Washoe Schools, a group led by its local there that successfully won a ballot measure to levy a half-penny sales tax for new school buildings. The union also burnished its efforts to co-opt progressive groups by giving $350,000 to Arizonans for Fair Wages and Healthy Families, a coalition that featured its Copper State affiliate; it successfully pushed for the passage of Proposition 206, which increased the state’s minimum wage from $8.05 an hour to $12 by 2020, as well as provide mandatory sick leave for all employees. But the union’s efforts didn’t succeed everywhere. In Oregon, it poured $2 million into Yes on 97, which failed to pass a ballot measure that would have levied a gross sales tax on businesses selling more than $25 million in products annually, as well as allowed the state to collect gross sales taxes on business producing more than $100,000 in revenue a year. AFT, whose teachers’ and nursing affiliates are also big players in the state, also put $1 million into the unsuccessful effort. NEA also failed in Oklahoma, where the $750,000 it gave to Oklahoma’s Children Our Future, which unsuccessfully pushed Question 779, which would have levied a one percent sales tax for additional school funding. Back on the national level, NEA still spent plenty to co-opt progressive groups. Whether it will work in the long haul — or even if the union can keep up the donations — is an open question. A big recipient of the NEA’s largesse is the Center for Popular Democracy, a reliable ally in the efforts of the union and the rival American Federation of Teachers in opposing the expansion of public charter schools. 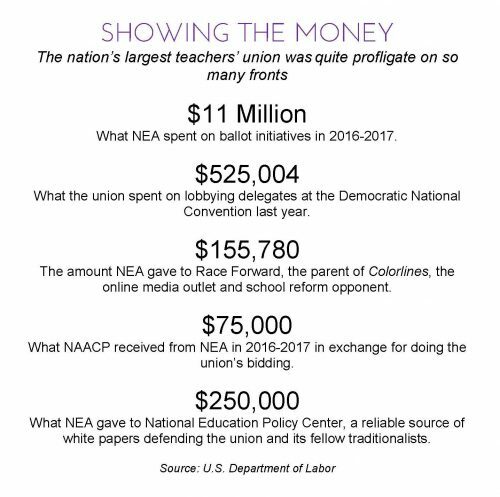 It collected $1.1 million from NEA in 2016-2017, double the levels the union gave it in the previous year. This increase isn’t a surprise; besides doing the bidding of traditionalists, Center for Popular Democracy is also a favored recipient of the ever-secretive Democracy Alliance, the outfit chaired by NEA Executive Director John Stocks. NEA also gave $1.1 million to America Votes, another outfit in the Democracy Alliance network that was cofounded by former Service Employees International Union President Andy Stern. That’s 177 percent more than what the union gave to the outfit in 2015-2016. Of course, it helps to be part of Democracy Alliance as well as count on “partners” such as AFT and the aforementioned Center for Popular Democracy. NEA made sure to give Democracy Alliance some coin. The union gave it $185,772 while handing another $25,000 to its Committee on States, and $300,000 to the State Engagement Fund. Altogether, NEA gave $510,772 to Democracy Alliance, one-third less than in 2015-2016. Apparently, the union isn’t exactly enthused by the outfit’s lack of results. As for the rest of the Democracy Alliance network? NEA gave $200,000 to David Brock’s Media Matters for America, unchanged from levels in 2015-2016; $150,000 to the Advancement Project (which helped NEA and AFT in its effort to eviscerate the No Child Left Behind Act) in 2016-2017, slightly less than in the previous year; $150,000 to Progress Now (a 33 percent decrease over 2015-2016); $50,000 to State Innovation Exchange; and $25,000 to Netroots Nation, unchanged from last year. NEA also spent $572,282 with Catalist, LLC, the data-mining outfit for the Democratic National Committee that is a lynchpin in Democracy Alliance’s campaign efforts; that’s 8.8 percent less than in 2015-2016. On the progressive media front, NEA gave $50,000 to Independent Media Institute, the parent of Alternet; and $50,000 to Center for Media and Democracy, the outfit behind PR Watch and ALEC Watch. The biggest recipient: Race Forward, the parent of Colorlines, which has garnered criticism from reformers for its rather unfavorable commentary on the movement. NEA gave it $155,780. It is also a new recipient of the union’s largesse. 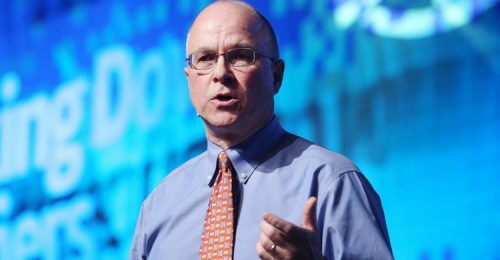 NEA Executive Director John Stocks is learning the hard way that the union’s pay-to-play efforts are yielding few (and scattershot) results. As for other progressive groups? NEA gave $1.3 million in 2016-2017 to Sixteen Thirty Fund, a endowment developed by former Clinton Administration mandarin Eric Kessler’s Arabella Advisors; that’s more than double the amount it ladled out to the outfit in the previous year. It also gave $300,000 to State Engagement Fund, an outfit run by Anne Bartley, another former Clinton Administration staffer and stepdaughter of one of Bill Clinton’s predecessors as Arkansas governor, Winthrop Rockefeller. It also gave $250,000 to Center for American Progress, which is a reform-oriented outfit, but has been helping traditionalists oppose the expansion of vouchers, a key tool of expanding school choice. The union gave $50,000 to Proteus Action League, an affiliate of Proteus Fund which has played small roles in ballot measures in California, Nebraska and Maine; $50,000 to Tides Foundation’s Advocacy Fund; and $10,000 to State Voices, a coalition of 20 organizations dedicated to voter registration drives and other mobilization activities. It gave $150,000 to Progressive Leaders State Committee; $50,000 to Good Jobs First (also an AFT vassal); $50,000 to the Chicago-based Community Justice for Youth Institute; $25,000 to economist Dean Baker’s Center for Economic and Policy Research; and $5,000 to Cornell University’s Center for Transformative Action. It also gave $250,000 to Corporate Action Network, a division of the Action Network Fund that aims to “address the imbalance of power between corporations and people” by allying itself with outfits such as NEA, which are just as powerful. Meanwhile NEA gave plenty to old-school civil rights groups and self-styled outfits willing to do its bidding. The biggest recipient among that group was Schott Foundation for Public Education’s Opportunity to Learn Action Fund. NEA gave it $125,000 in 2016-2017; it received nothing from the union in the previous year. The union also gave $50,300 to the Congressional Black Caucus Foundation, gaining access to top congressional leaders as well as other influencers at its annual conference. Meanwhile NEA gave $75,000 to NAACP; the better for the once-respectable civil rights outfit to continue opposing the expansion of charters and other school choice options Black families desire. It also gave $25,000 to National Urban League, which is far less reliable. NEA also gave $25,000 to the U.S. Hispanic Leadership Institute, $20,000 to National Council on Black Civic Participation, $10,000 to National Center for Transgender Equality, $10,000 to Gay, Lesbian and Straight Education Network, and $25,800 to Smithsonian’s National Museum of African American History and Culture. Reaching out to immigration reform groups opposing the Trump Administration’s efforts to deport undocumented emigres, NEA gave $50,000 to National Immigration Law Center. It also handed out $35,000 to United We Dream, which works on behalf of the 760,000 undocumented immigrant children, youth, and adults (including 20,000 teachers) who may be deported thanks to the administration’s move in September to end Deferred Action for Childhood Arrivals. As for the usual suspects? : NEA gave $50,000 to FairTest (also known as National Center for Fair and Open Testing), the leading outfit in opposing the use of standardized tests, the data from which can be used in evaluating the teachers in NEA’s rank-and-file. The union gave FairTest the same amount in 2015-2016. NEA made sure to pay off Kevin Welner’s National Education Policy Center, sending $250,000 to the outfit in 2016-2017 through the University of Colorado-Boulder’s foundation; that’s also unchanged from last year. NEA also handed $408,659 to Council for the Accreditation of Educator Preparation, the group that represents the nation’s woeful university schools of education; provided $124,300 to National Board for Professional Teaching Standards; gave $527,542 to Barnett Berry’s Center for Teaching Quality; and handed out $225,000 to the ever-dependable Great Lakes Center for Education Research and Practice. NEA gave $68,400 to Learning First Alliance, and $100,000 to Education Law Center. Again, it’s good to be NEA. For now. For the teachers who pay into it, often thanks to the compulsory dues laws the union defends, it may not be so good. Dropout Nation will provide additional analysis of the NEA’s financial filing later this week. You can check out the data yourself by checking out the HTML and PDF versions of the NEA’s latest financial report, or by visiting the Department of Labor’s Web site. Also check out Dropout Nation‘s Teachers Union Money Report, for this and previous reports on NEA and AFT spending. Typical grist from the anti-public education crowd. No one these days seems to care about those children who got left behind or who aren’t apparently one of the “every students” in the latest bill. I spent a career teaching those children. And I’m continuing as an advocate at the state and local level. Thank God that John Stocks and a few other people still care about other people’s children, unlike those who simply hate any voice that speaks up for regular teachers who do their best and expose the “reform” schemes for what they really are. This article is all about politics, and nothing about children.